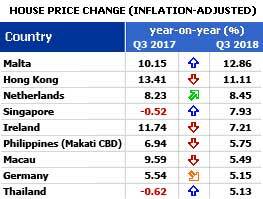 Most of Europe and parts of Asia continue to experience strong price rises. There have also been notable increases in Singapore, Russia and Qatar. But Hong Kong, China, Sweden, Montenegro, Turkey and most of the Middle East have experienced either house price falls - or a sharp deceleration of house price rises. 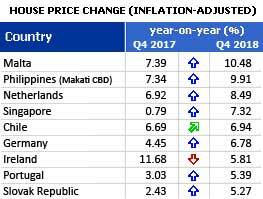 Most of Europe continues to experience strong price rises, especially Ireland and the Netherlands. In Asia Hong Kong and Macau have risen strongly over the past year.